Chronic fatigue related with long hours of work is common in the ICU and this phenomenon is aggravated by acute fatigue related to the night shift and the sleep deprivation. The intensivists are faced with arduous night shifts throughout their career, with a need for thinking and decision-making efficient and fast. This is something that probably everyone understands, without being health care professional. Tiredness affects the safety of the patient, and fatigue can generate medical errors. Experience could minimize the risk of error, but the competition probably can not replace the required rest. A previous study carried out in French ICU concluded that 46% of the surveyed intensivists suffered from exhaustion, and 24% suffered from depression. The number of working hours was associated with a high level of burnout. Intensive Care Medicine has just published online the article Night shift decreases cognitive performance of ICU physicians, where performance of intensivists was investigated after a night shift using validated cognitive tests (Wechsler Adult Intelligence Scale and Wisconsin Card Sorting Test). 1. 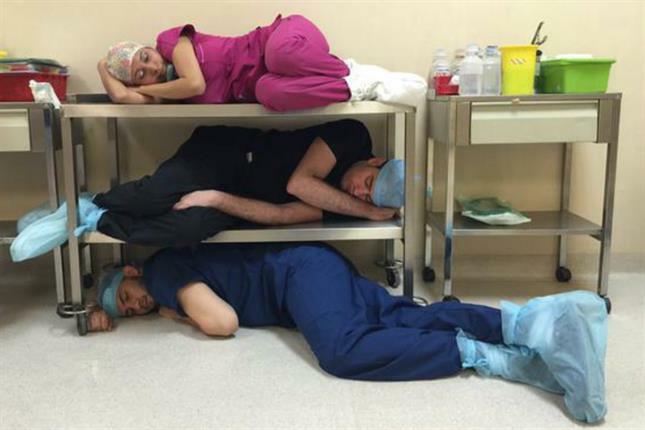 Cognitive abilities of the ICU physicians decreased after a night shift. There was no significant difference between residents and staff doctors. 2. The intensivists were unable to assess their ability to fatigue and attention. If a doctor is unable to evaluate the tiredness and minimizes its impact, he/she could neglect the risks to his/her own health and patients. 3. Several factors could be in favour of a better performance in older doctors, since it was observed that older people sleep on average more than residents during the night shifts. On the other hand, physiologically with age, the need is less in terms of hours of sleep and this can help a faster recovery. Experience can also help to go back to sleep easily after be awakened since the stress falls more quickly. Finally, a “major strategy” is described to solve a task. Indeed, after having tested successfully for many years an effective way to solve a problem, one older person will scatter less to find alternative solutions. On the other hand in this study, experience does not seem to protect even to the most experienced intensivists, even though the average time of sleep during the night shift was greater than the residents. 4. Although proven skills diminished significantly after a night shift, the results do not allow to assess the impact on the quality of patient care. The debate continues, but now there is a strong tendency to the limitation of working hours of doctors, at least in Europe and the United States. This study extends the physiological knowledge about lack of sleep among the intensivists after a night shift, and defies the current knowledge of the cognitive consequences of acute fatigue. More studies are needed to clarify whether the cognitive actions of the ICU physicians decrease during a night shift, as well as the possible consequences for patients of ICU. In fact, the possible harmful consequences for ICU patients still have not been studied. It is also essential to optimize the organization of physicians and to study the consequences of the lack of sleep in the ICU physicians health.